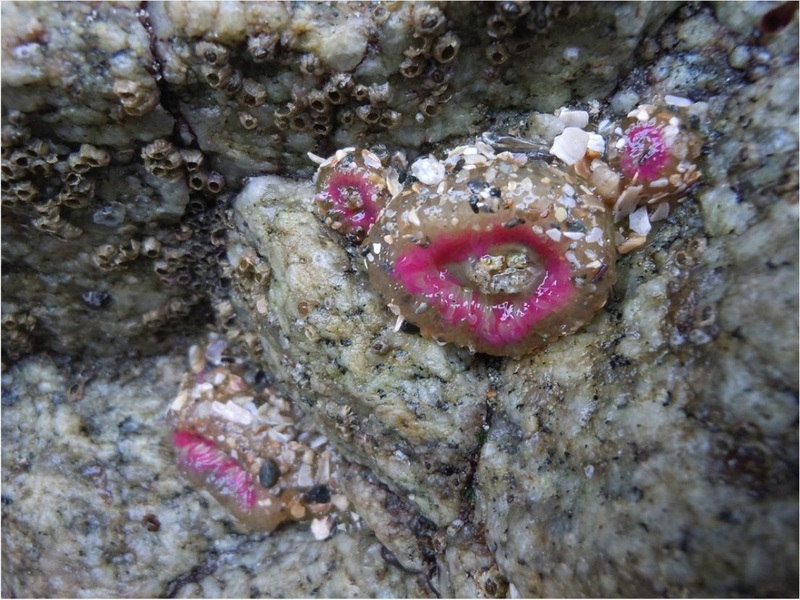 Aggregate green anemone colonies found in the rocky intertidal of Calvert Island beaches. Photos by, clockwise from top left: Julie Mundy, Kelly Fretwell, Becky Segal, Sarein Basi-Primeau, and Sienna Hamilton. 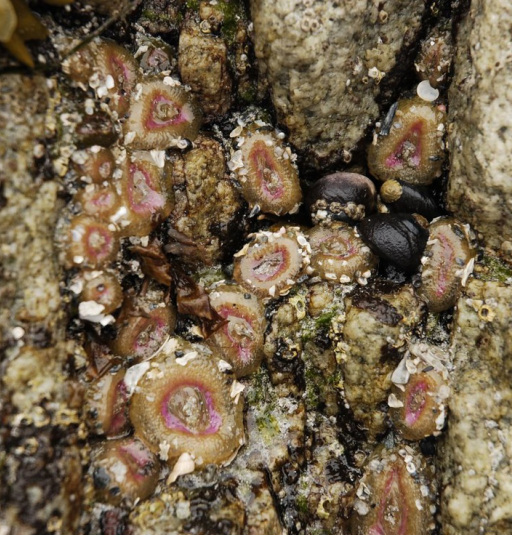 The aggregate green anemone is a relatively common intertidal species. It is usually fairly small, though it can reach up to 8 cm in diameter and 15 cm tall. It has an olive green (sometimes quite pale) column lined with rows of tubercles, which can give it a ribbed or bumpy appearance. The oral disc is olive green with radiating stripes, and is encircled by five rings of green tentacles. 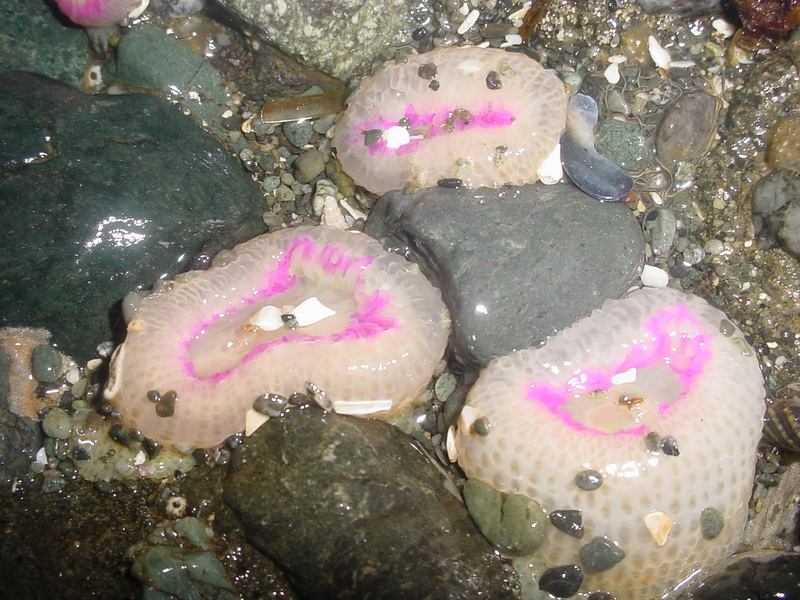 These tentacles are usually tipped in bright pink (or sometimes blue or lavender); the colour of the tentacle tips is visible as a colourful ring when the tentacles are retracted.This species forms clonal colonies, and the budding of a new individual within this colony may be witnessed mid-split. Aggregate green anemone colonies grow on rocks and other hard surfaces such as pilings. Colonies tend to accumulate sediment and shell bits, so individuals may be partially buried in sand. This species is found in the intertidal and shallow subtidal areas of semi-exposed shorelines. Its range stretches along the west coast of North America from Alaska to California. The giant green anemone is the most similar to the aggregate green anemone. 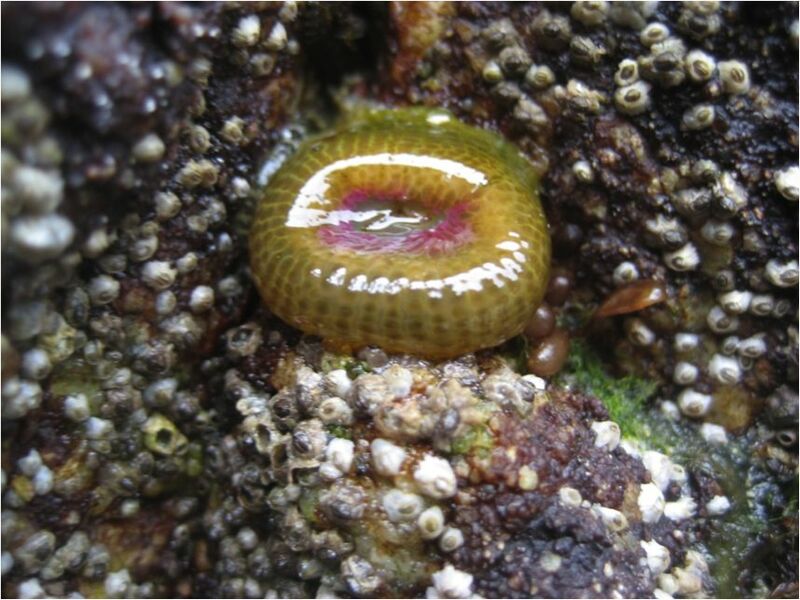 While both have a similar olive green or brownish green column, the giant green anemone has a bright green oral disc and tentacles, whereas aggregating anemones have green-striped oral discs with pink-tipped tentacles. 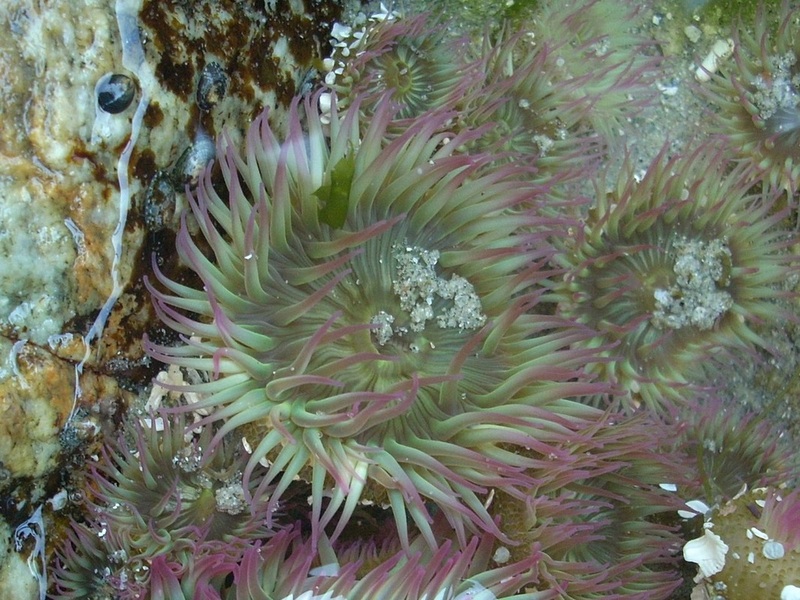 The giant green anemone is generally much larger as well, and though individuals may be close together this species does not form clonal colonies. This species has a ring of white knob-like tentacles called acrorhagia, which contain stinging cells that are used to fight off aggregate anemones from other colonies. These tentacles are not always visible, but sometimes can be glimpsed as flashes of white amongst the other tentacles, and they are very visible during a turf war. This form of defence leads to very definite boundaries between colonies. This species' green colouring comes from symbiotic zooxanthellae and zoochlorellae (algae) that are present in their tissues. The colour is usually from simply the presence of the algae, though the unicellular alga Chorella can cause the anemone to produce pigment as well. 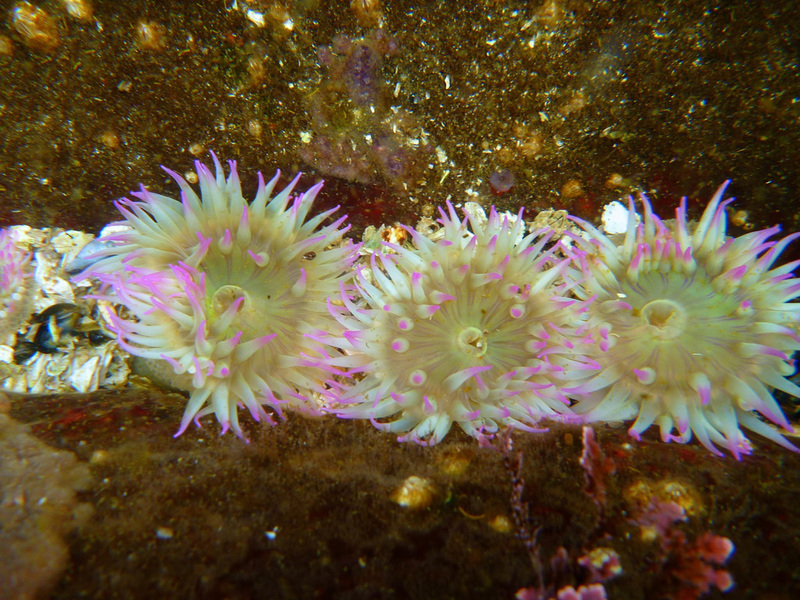 Aggregate green anemones can lose their algae in conditions of low light, at which time they turn white with pink tips. This species has been the subject of many research studies. Read about some of these studies here. 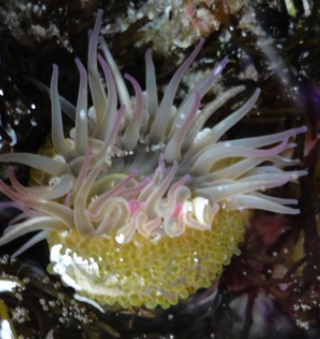 Read more interesting facts about aggregating anemones on the Monterey Bay Aquarium site. Carefoot, T. (2010). Anthopleura spp. Learn About Sea Anemones and Relatives. A Snail's Odyssey. Accessed 31/07/2013. Harbo, R. M. (1999). Whelks to whales: Coastal marine life of the Pacific Northwest. Madeira Park, BC: Harbour Publishing. P. 42. White, B. (2002). Anthopleura elegantissima (Brandt, 1835). Invertebrates of the Salish Sea. Rosario Beach Marine Laboratory. Accessed 31/07/2013.